About 40 years ago, I purchased a pair of sweater wheels from a Herrschner's catalog. There was a set-in sleeve version and a raglan sleeve version. Each wheel had children's sizes on one side and adult sizes on the other side. After many years, my sweater wheels look as if they have been through the wars. And in a way they have been. I always kept them covered with a clear plastic bag to protect them. The sweater wheels indicate that a Bea Freeman put a copyright on these devices in 1969. Each sweater wheel consists of three cardboard circles: There is a larger middle circle that contains rows of numbers radiating out from the center. The larger circle is sandwiched between the two smaller circles. The two smaller circles contain slotted holes that allow the numbers on the larger circle to show through in juxtaposition with sweater instructions on the surface of the smaller circles. The three circles are held together in the center by a brad that allows the smaller circles to be rotated over the surface of the larger circle. 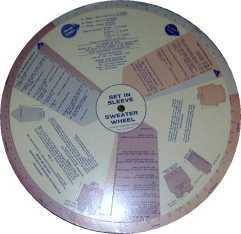 The outer perimeter of the larger wheel has sweater sizes printed on it. The effect is sort of like "dial a sweater". By rotating the one of the smaller wheels, you select a sweater size. Then you follow the sweater instruction, where the appropriate variables peek through from the larger wheel to give you the right number of stitches, inches, decreases or increases to make the sweater. Sweater wheels are sometimes offered for sale on E-bay.com auctions. Make selections in the three lists below. Then press the GO button to view a basic pattern for a sweater using your selection. This sweater pattern is the conventional construction in which the sweater is made in several separate pieces that are sewn together after blocking.